Plans to open a cat cafe in the Devon town of Totnes have been criticised by an animal welfare charity. Liz Dyas, a former nurse who lives near the town, hopes to provide a feline-friendly establishment, where people can de-stress in the company of cats. Japan, Austria and Russia already have cat cafes and one is currently being considered in London. But Cats Protection has opposed the idea, claiming it would be stressful for the animals. “Having quite a large number of cats within a confined space with different people coming and going would actually be very, very stressful for cats and the biggest stress in a cat’s life is other cats, so we believe this would be poor welfare for the cats,” a spokeswoman said. Ms Dyas, whose six “sociable” cats would be in the cafe, said pet therapy is acknowledged by many people as beneficial and can help to reduce people’s anxiety and stress. She said Totnes, which is known for its alternative lifestyle image, seemed the ideal location for her feline therapy cafe. She said the number of customers – who would “obviously be cat lovers” – would be limited to maintain a “quiet environment” and sleeping cats would be left undisturbed. 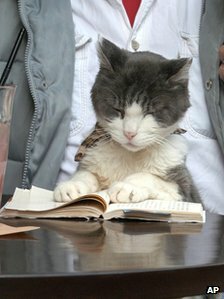 “The idea really is to provide a beautiful, comfortable, quiet lounge where people can come if they’d like to and sit amongst the cats,” Ms Dyas told BBC News. 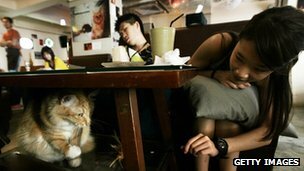 She said she did not agree with the Cat Protection’s claim that a cat cafe would be stressful for the animals. “I’m sure my cats are going to love it,” she said. “It’s always difficult to be a pioneer, but I’d say to people ‘come and see’ – we love our cats – and you’d see they have a superb environment, they have everything they need and they certainly won’t be put upon by people. But in a statement, Cats Protection said cats, unlike dogs, were generally solitary animals and keeping them in a confined space like a cafe with a changing group of people would not be good for them. “Although Cats Protection does not have powers to prevent a cafe like this from being set up, we firmly believe that this kind of environment is not suitable for domestic cats,” the statement said. The charity said it believed that people who cared about the wellbeing of cats would not wish to encourage the venture. The application for the cat cafe in Fore Street will go before planners later this month. South Hams District Council said it was unable to comment on the application.